Rental Agreement: What You Need To Know? Assam is one of the states where the economy is largely based on agriculture with more than half of the state indulging in it. The growth of large and medium scale industries have also shown a considerable increase. Agro-based industries also prevail in the state coupled with the tea industries which contribute to the major part of the state’s income.If you are one among the immigrants of Assam and have a rental stay, then you would have to create a rental agreement. Now, setting up a rental agreement is much simpler with the help of LegalDesk.com. Given below are the important things that you will have to remember while creating a rental agreement in Assam. A rental agreement or a lease agreement is a consent agreement which is approved by both the landlord and the tenant after negotiation, whereby the landlord gives the tenant the right to occupy the premises. 11 months lease agreement: This type of lease agreement has a duration of only 11 months after which the agreement expires. The agreement could be extended if both the landlord and the tenant wishes to do so. Long term lease agreement: This type of lease agreement is mainly for residential purposes. It extends for a longer duration which could be a year, 5 years, 10 years and above. Commercial lease agreement: Commercial lease agreement is an agreement wherein the landlord rents the property for business purposes. The tenant can personalise the lease by including the clauses required as per the nature of the business. Accurate details: Make sure that the details given in by both the landlord and the tenant are accurate. Lock in period: Lock in period is the minimum period before which neither the landlord nor the tenant is allowed to withdraw the agreement. Security deposit: It is the amount that is to be paid in advance to the landlord by the tenant. The landlord is accountable to pay back the caution deposit deducting all the maintainance charges that are caused due to damages. The rental agreement should mention the amount that is to be paid as the deposit. Penalty for late payment: The landlord is allowed to impose a penalty on the tenant if the rent is not paid within the stipulated time. Maintenance charges: The landlord is expected to pay all the maintenance charges except for the ones that are caused due to the lack of care of the tenant unless stated otherwise. If the agreement states that the tenant has to take care of water bills, electricity bills or any other, then it has to be done so. Rent payment date: The landlord is allowed to include a clause mentioning a specific date before which he wants the rent to be paid every month. The penalty charges are applicable after that date. Pets: The landlord can mention if he permits the stay of pets in his premises. Draft an agreement with the accurate details of both the landlord and the tenant. Personalise the agreement by adding the required clauses. Print the agreement on a stamp paper of the recommended value. Sign the agreement in the presence of two witnesses. Register the agreement in a sub -registrar office. The Assam Urban Areas Rent Control Act, 1972 governs the rent control and the rental agreement procedures in Assam. Rent agreement registration is always better because in that case, the sub-registrar goes through the given details and validates their existence. This ensures that the provided information is legitimate and thereby ensures better security. Generally, a 11-month rental agreement is preferred, as it requires no registration at the Sub-registrar office. Notarization is not necessary in India. But still, many people go to a notary public and get their agreement attested assuming it will give an extra level of security as the details are once again validated. However, it is up to you to decide whether to get it attested by Notary or not. Going to a lawyer to draft your rental agreement is a tiring and tedious process. Now, you can create your rental agreement online in a very few steps given below. Visit LegalDesk.com and open the pre-drafted, lawyer verified rental agreement. Fill in the details of the landlord and the tenant. Personalise your rental agreement by adding necessary clauses. Print the rental agreement on a stamp paper of the recommended value or allow us to do so and deliver it at your address. Sign the rental agreement in the presence of two witnesses. Take it to a Sub-Register office and register the document. Moving to a new place is simpler than battling out the differences that you have with the landlord. Creating a rental agreement online saves you from the mind boggling process of running behind lawyers to include the clauses to personalise your rental agreement as they are already mentioned in the agreement set up by us. 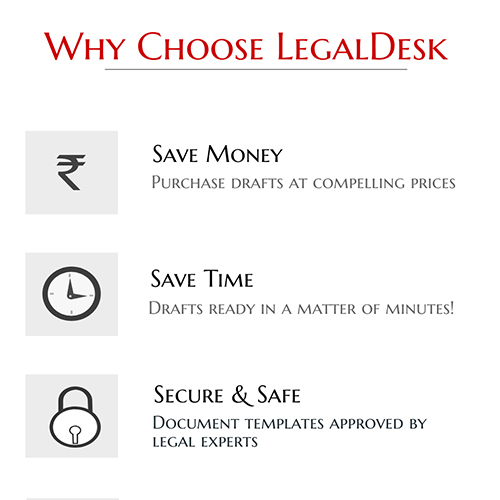 Also, since LegalDesk.com provides the provision of printing it on the stamp paper of the recommended value and delivering it at your address, the work becomes even more simpler. There are 1 comment on "Rental Agreement In Assam".